MedicalPress Theme is premium WordPress theme and with every new update release, our development team fix bugs, add new features, improve performance and enhance existing features. So, It is important to keep it updated to have latest features and avoid problems. In this article, I will explain how you can safely update MedicalPress Theme to its latest version. The first and the most important step of the update process is to backup your entire website just in case if anything goes wrong. For backup, If you not already have a system in place then my recommendation is UpdraftPlus WordPress Backup Plugin. In order to make sure you have the most recent/latest and secure (virus/malware free) version of MedicalPress Theme, follow the steps below. Once you are on the downloads page look for MedicalPress theme and the Download button in front of it. Now when you will click on the download button you will see a drop down with multiple options. 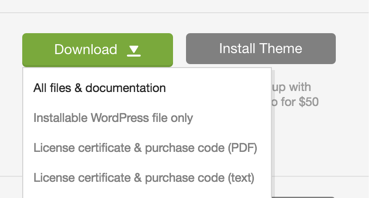 In this drop-down list click on All files and documentation and you will download the full package of MedicalPress theme including the premium plugins which come with it (screenshot below). Now you have the full package of the latest version of MedicalPress Theme, extract it and continue with the rest of the update process below. It is not a good idea to leave the website as is while it is under an update process so you should display a nice message and activate the maintenance mode and in this case, our recommendation is Maintenance Mode Plugin. Before updating MedicalPressTheme, there are few things to take care first. So, make sure to go through the following points. Secure Important Customizations: One of the most important things to check is if you have made any customizations then those should be in the child theme which is the best practice. So, if you have made any code level changes then move/copy them to the child theme (if you are not running your website using the child theme then install and activate the child theme and then copy/move the modified files to it). A basic MedicalPress child theme is included in the package you have downloaded from themeforest. Critical Step Before Update: If you are using MedicalPress Theme version 1.6.1 or earlier with some code level customizations then you must compare your modified code with the latest codebase of MedicalPress Theme because in version 2.0.0 there are major files and folders structure changes and code changes are implemented with an entirely new design called “Reborn“. So, To keep your old changes you have to adopt new files structure in child theme after updating parent theme. If you are updating the theme from version 1.6.1 or earlier then you might want to switch to the new Reborn design for a fresh look so you can follow the following steps. Navigate to Dashboard → Theme Options → Design Variation and select the design of your choice and save the settings. After saving the settings the next step is to regenerate all the images according to the new design chosen in the first step. So, install and activate Regenerate Thumbnails plugin. After activation, navigate to Dashboard → Tools → Regenerate Thumbnails and regenerate all thumbnails. Once it is done, then make sure all to check all the page related options.